“We live in constant memory since there is no present in the sense of something we can see or define, only the memory of the instant before. We see the moment of discovery written on the screen of the past, how can it be otherwise? There is no thought without it first happening and no memory without describing it. We are a continuum of visual imagery and definition; a rolling wave forward where the surf never quite reaches the beach. 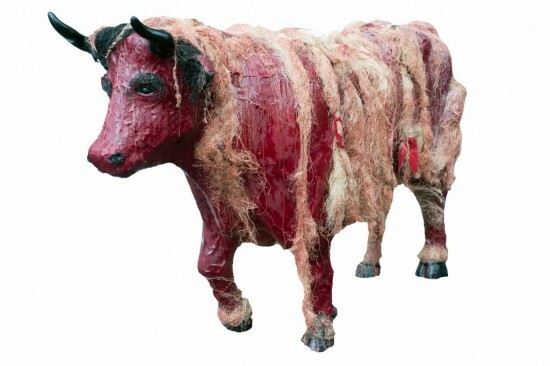 What does this prose have to do with an Ox that by any other name is a ragamuffin of tatters and hemp, wax and cardboard, red fabric and burlap impregnated with tar, you might well ask? Like us, in the end, that Ox is a wandering collection of days and years and miles traveled. Time that we spend collecting our memories of each passing second and placing them on our backs in a vain attempt to coordinate our lives like a Paris fashion designer; and although we are rarely as successful as we would like, we never cease to try. Materials: Hemp, fabric, wax, cardboard, burlap, plastic and rubber, among other resources using a myriad of fabrication techniques. They included, but were not limited to, glue, fiberglass, wire, drilled hole insertion (think chia pet) and painting.